Indiana, and much of the Midwest, shivered this week under a polar vortex causing windchill temperatures well below -40 degrees Fahrenheit. We recorded -15 degrees F this morning as an ambient temperature with -41 F windchill. 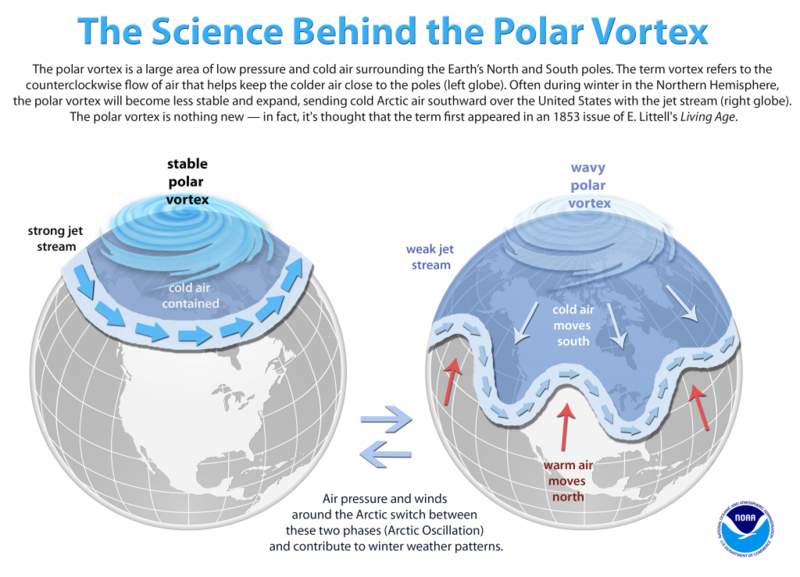 What is a polar vortex, you ask? Well, here is a bit of nerdy science for you from NOAA. Temperatures were dangerously cold enough to cause frostbite quickly, so area schools including Taylor University, where I work, shut down for Wednesday and Thursday. Angie and I were inspired by this chilly weather-induced mini-vacation to watch The Day After Tomorrow, a disaster movie that depicts a rapid ice age induced by global warming. It is a hokey but fun movie to watch, especially snuggled up on the couch together under a warm blanket, while the wind howls and beats against the house. Watching this movie with people trying to survive the extreme temperatures, ice, and snow and checking how cold our temperature dipped to here in Upland got me to thinking about other arctic-inspired entertainment. Other movies inspired by arctic survival that come to mind are 30 Days of Night, Snowpiercer, and The Thing. Arctic survival is only on the edge of these movies, but it sets the tone of extreme survival like The Day After Tomorrow. Then there are quite a few great board games based on surviving arctic extremes like Arctic Scavengers, Dead of Winter, K2, and the new winter side of the board for Stone Age: Anniversary. But what this really got me thinking about is a mini RPG campaign I ran years ago using the Palladium Role-playing Game and an urge to return to that idea again sometime soon. The original was a barbarians of the north focused campaign inspired by some of my favorite art by Larry Elmore, depicting various fantasy scenes in snow-covered settings including Shadamehr Ecounters Baakish Vaah, Avalyne the Life Giver, Bloodstone Lands, and Crystal Shard, which was the cover of the same named book. I was intrigued by the idea of moving away from traditional woodland, dungeon, and city adventures for fantasy gaming. Instead, my players played a human barbarian and wolfen warrior type surviving in the far northern lands of my world where at one time of the year, the sun never shined during their adventures. They had to contend with surviving the weather, dealing with hungry northern predators, and a barbaric society loosely based on Nordic and Icelandic myths and history. None of the typical fantasy villages and cities, easy roads and paths to travel, or camping casually outside for the night. Everything in that too short of a campaign had to be thought about deliberately by the players, survival and society were so different, which changed the tone from what we were used to which was fun. So with all this dangerously cold weather outside, and visuals of The Day After Tomorrow in my head, I have this urge sometime in the future to return more seriously to that idea of an arctic-based fantasy rpg campaign. I would like to try running it using the D&D 5e rules, with some modifications for the survival aspects. Already researching potential source books (some of which I already have) including the AD&D Wilderness Survival Guide, the Complete Barbarian’s Handbook, the Vikings Campaign Sourcebook, Mythic Iceland, Reign of Winter, and Frostburn. Are there other rpg-related sourcebooks you recommend I check out? I will also be doing some research on the historical cultures and societies of the northern climates. What odd events or experiences, like a polar vortex, have inspired your writing, art, cinematography, game design, or rpg adventures? ← Writing & Editing for Gaming Course: What are THE BEST written/edited RPGs and Tabletop Game Rules?